The International Trade Center at Southern Illinois University Edwardsville (ITC at SIUE) announces the 2019 Southwestern Illinois Trade Mission to Peru, Chile and Colombia from March 24-30, 2019. The Southwest Illinois Trade and Investment Council (SWITIC) will lead the trade mission with the full support of the ITC at SIUE, the Office of Trade and Investment of the Illinois Department of Commerce and Economic Opportunity, and the U.S. Department of Commerce. The ITC at SIUE will develop a full itinerary for each participating company with opportunities to conduct private, one-on-one meetings with key partners and buyers in one, two or all three countries. Services offered include matchmaking, export counseling, and travel and logistical support. A limited number of companies will be accepted on a first-come, first-served basis. Participation fees vary per country. Recruitment ends Friday, Jan. 4. Torres Bowman urges interested businesses to indicate their interest now, so organizations have time to prepare and support them in mission planning. She also notes that the mission could qualify for Illinois State Trade Export Promotion (ISTEP) financial funding offered to small and medium-sized exporters. Businesses can be awarded up to $7,500 in travel cost reimbursements. Details on eligibility and the application process are available at siue.edu/business/ITC/ISTEP. For information on how your company can participate, contact Torres Bowman at sitorre@siue.edu or call the ITC at SIUE at 618-650-2452. The Southwest Illinois Trade and Investment Council (SWITIC) has been in existence since 2015. The nonprofit organization educates, equips and connects area businesses with the expertise and contacts to begin and expand exporting their products. The International Trade Center at SIUE serves entrepreneurs and small businesses in southern Illinois by providing individualized, no-cost export consultation, identification of foreign buyers, agents and/or distributors through trade leads, international market analysis and more. The ITC is funded through a cooperative agreement with the U.S. Small Business Administration, the Illinois Department of Commerce and Economic Opportunity, and Southern Illinois University Edwardsville as a service to the region’s entrepreneurial and business community. It has a longtime partnership with the Illinois Office of Trade and Investment (OTI), which maintains a full-time staff of both foreign and domestic-based international trade and marketing experts. OTI also manages 6 foreign trade offices located in Belgium, Japan, Mexico, Canada, China and Israel. As a key member of the Illinois SBDC Network, the International Trade Center delivers these important services to its clients while supporting the goals and objectives of both the SIUE School of Business and the University at large. 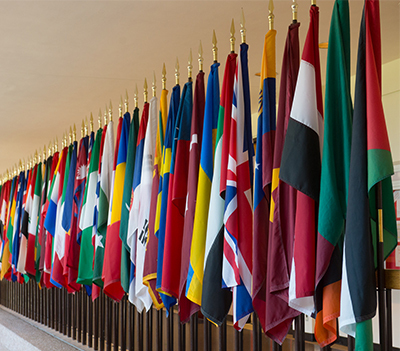 Photo: International flags at SIUE.